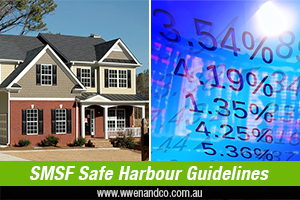 Guidelines on the arm’s length terms commonly known as the “safe harbour” terms have been released by ATO. these guidelines apply when an SMSF acquires an asset under limited recourse borrowing arrangements (LRBAs). This has been a difficult area for SMSF trustees to contemplate and be free from doubt. The practical compliance guidelines (PCG 2016/5) detail interest rates, loan-to-value ratios (LVRs) and various terms that make up the accepted safe harbours for SMSF LRBAs so that arrangements will be seen by the ATO as being consistent with an arm’s length dealing. Basically, this is to ensure that these arrangements do not give rise to non-arm’s length income (NALI), which is taxed at a high rate (47% in the 2016 year) even if the relevant member is in pension mode. These announcements are retrospective, so any LRBAs currently in operation need to be considered. There is no grandfathering of existing arrangements. SMSF advisers and practitioners, and indeed SMSF trustees, should review any LRBAs already entered into that are funded through non-bank sources. Speed may also be imperative, as the ATO has set a deadline of June 30 to have all such arrangements rendered compliant. Interestingly, there are no safe harbours for other types of asset loans, and these can be the most contentious loans to identify an arm’s length benchmark equivalent. For real property, the RBA indicator lending rate for standard variable housing loans for investors in May (5.75% for 2015-16) can be used for LRBAs in existence at the date of the Guideline’s publication. For 2016-17 and later years, it will be the rate published for the May before the relevant financial year. Interest rate parameters for the other class, being shares and units, have an added 2% surcharge to the interest rate. This seems in-line with common banking practices. Loan-to-value (LVR) ratios are also critical. The guidelines prescribe 70% LVR for property, and 50% for shares and managed funds. Further, the guidelines prescribe a 15-year maximum loan term for property, and seven years for shares and managed funds.